Backing up files have never been this easy – right click on any file to backup safely in your inbox. ‘Backup to email’ is one click backup solution that allows you to backup files to your email account. Right Click on any file on your computer. 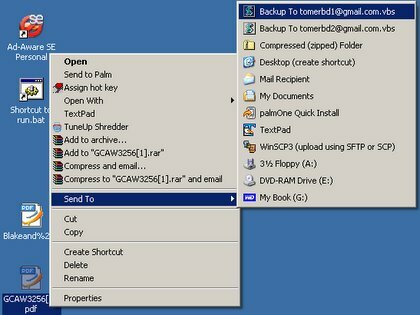 Select ‘Backup to Email’ option. That file is sent in zip format via email to your Gmail account. There is no limit on the size of files you can backup using this procedure. However, files greater than 10 MB are backed-up in parts which can be later joined or merged with ease. Using this you can backup a specific file or even a complete folder by the simple right click procedure. After you download andÃ‚Â install the software, enter your Gmail account login details and you are all set to backup by sending an email with a right click. You can configure multiple gmail accounts and select specific Gmail account for specific files. If connection is disconnected in the middle of file transfer then it will auto-try to re-send that file with total of 100 auto retries. One small and free utility for safe keeping of your important files in your Gmail account. This software is only available for Window users, MAC users probably need to wait. Holy cow! It doesn;t get any easier than this! Nice tip!